You heard everything was closed in Avignon in August? Don’t panic! While the majority of the locals is on holiday, we’ve been looking out for great activities for you to do if you’re planning to visit the Papal city in August. It is true, most shops and (good) restaurants will be closed in August but that doesn’t mean the city will feel like a deserted place. 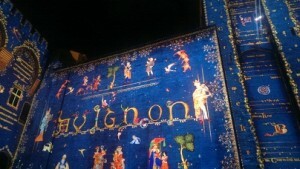 There is still a few good reasons for you to choose Avignon as your holiday destination this summer. The craziness of the Festival is (finally!) over, which means we’re slowly going back to normal, and you will see that on accommodation prices for example, as well as a better service in restaurants ! Coming after July is an opportunity for you to soak up the real “Avignon life” and not just the touristy side of it. So, if you’re little worried about being bored while everyone else is on the beach, here’s a list of things that should keep you entertained during your stay. 10 am: Head to “Les Halles” market, already mentioned in a previous post. This is THE thing not to be missed in Avignon. Skip your hotel breakfast and sit at one of the cafés inside the market for a good coffee. If you want to soak up the authentic atmosphere, stay at the counter and soon a local or two will start having a conversation with you. Fancy a pastry with your coffee? Grab a delicious buttery brioche or pastry at “Boulangerie Violette”, there’s no better way to start your day! After this truly French breakfast, take your time to enjoy the market and get to know what’s in season. We will never say it enough, don’t be afraid to ask. All the stall holders in “Les Halles” are passionate about what they do, so they will be more than happy to give you the explanations on how to cook this or that. 11.30am: Take a walk down the cobblestoned “Rue des teinturiers” (the dyers street), the most picturesque street of Avignon. Its wheels on the Sorgue Canal and the plane trees give it a unique atmosphere. After taking a few pictures or enjoying a drink in the shade of the plane trees, make your way to the Rhône River, to get the boat shuttle. 12h30: Take the boat shuttle to the “Barthelasse Island” to reach your lunch spot. Et oui! 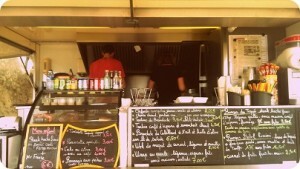 On the other side of the river you will find a new gem: The first food truck in Avignon! “Les Toqués en Vadrouille” offer healthy fast food, made with local products (fruits and vegetables come from the island! ), with a daily changing menu! Before ordering the dish of the day or their “house burger”, you can enjoy a glass of local wine, with stunning views over Avignon and the Bridge. Their daily specials are varied, from burger to salads, wraps or proper dishes like pan fried duck with vegetables. Everything is 100% fresh and made right in front of you. If you have a sweet tooth, they also have a selection of homemade cakes and puddings and serve Nespresso coffee. 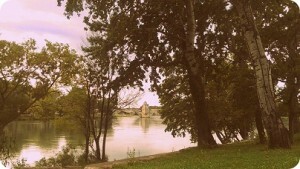 For less than 20euros you can enjoy a good homemade lunch, on the beautiful Barthelasse island. TIP: If you’re renting a self-catering apartment in Avignon, we strongly recommend you to go to the organic farm “La Reboule” on the island to get your 5 a day. Organic seasonal fruits and vegetables, directly from the farm to your basket! They also have a selection of locally made honey, goat cheese, olive oil and fruit juices. The prices are better than anywhere else and you will be buying directly from the producer. After a lovely lunch, take a walk down the Rhône River and make your perfect holiday picture or simply … have a nap on the grass! 2.30pm: A unique exhibition is on this year. 10 years ago, the prison of Avignon closed down and a 5* hotel brand had the idea of converting it into a luxury hotel but luckily the city of Avignon turned down the project! And this summer, for the first time in 10 years, the prison is opening its doors to the public thanks to the Modern Art Museum in Avignon. 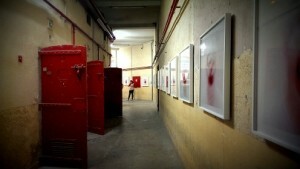 It can sound a little weird to have a contemporary exhibition in a former prison, but it’s a unique opportunity to visit this building full of history. Every cell presents a piece of art, whether it’s in relation with the prison history or not, from a different artist. There are also some archives of the prison, videos about it during WWII and more. We’ve been there and we’re lucky we did, but be prepared for a long visit! As always, modern art can be appreciated … or not! But we did find it very interesting and would recommend the visit. Entries are 10euros; the visit will last about 3H if you look at every piece of art and watch every single video. 5.30pm: Wonder around the “Fourbisseurs” street, the heart of the pedestrian area of Avignon in search of a present or two or just to enjoy a bit of window shopping. The best artisan shops are in this area. 8pm: Dinner time ! Holiday’s about food, isn’t it ? Well we do have a great off the beaten track restaurant that is open in August! “La Manutention” offers simple, unpretentious local food made with seasonal ingredients. The location behind the Popes palace and the lovely terrace on a quiet street make it the perfect romantic spot. 10pm: We have a couple of options for you to finish this lovely day, depending on the weather ! 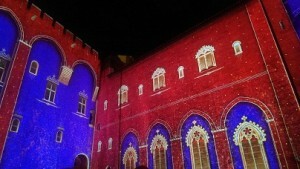 Lovely warm evening: Go to see the magical “Luminessences” light and sound show in the Popes Palace. The courtyard turns into a 3D show about the history of the Popes Palace and Avignon. Stunning and surprising! Entries are 10euros, bookable at the tourist office. Cold? Windy? Rainy? Well, there’s a fantastic option right next to the restaurant: The Manutention Cinéma, one of the few cinemas in Provence that offer OV movies. So if hearing George Clooney speak French might sound a little weird to you (yes, all movies are dubbed in France!) well this is your lucky day. Movies, documentaries … every night they show 3 to 4 different movies. Besides, we love the fact that this is a small independent cinema. Adult: 6,50euros. With all our suggestions, you won’t have time to get bored … Enjoy Avignon!